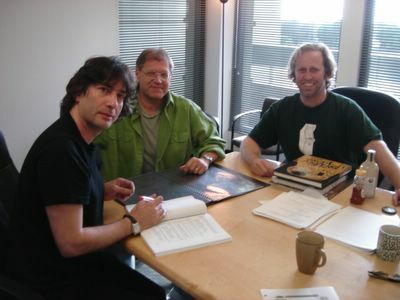 Left to Right -- Me and (director) Bob Zemeckis and (my fellow writer) Roger Avary yesterday at the end of three days of script work on Beowulf. All the photos that were taken of us actually working are unusable because we're making the sorts of bizarre faces that people tend to make while making things up. Also, in several of the photos, Roger is fondling (or possibly gesturing with) either the honey-squeezer or the mead-bottle. The casting of this film is fascinating. It's actor driven, and there really aren't any stars in it. Well, as far as I know, and yet. I'm home now. Tomorrow I plan to plant things, and to walk around the garden a lot. Even at night I can see that the cherry tree has blossomed. And I just realised that I never mentioned here that the MirrorMask illustrated script book has been published (this is the Amazon link, this is the B&N, and this the link to booksense.com). I'm going to try to get in to DreamHaven over the next week or so, and once I have done they may have some signed ones there -- check their neilgaiman.net website.